…both metaphorically and now, perhaps literally. Within the next couple of weeks, a remote part of north-western Tasmania is likely to grab headlines around the world as a major climate change marker is passed. 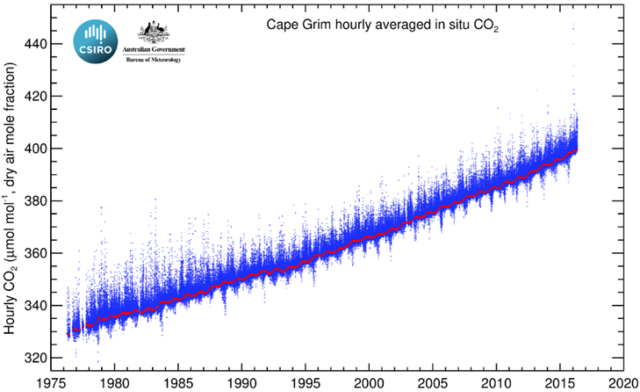 The aptly named Cape Grim monitoring site jointly run by CSIRO and the Bureau of Meteorology will witness the first baseline reading of 400 parts per million (ppm) of carbon dioxide in the atmosphere, researchers predict. Considering the existential nature of the public policy challenge, it most certainly appears Australian interest [as gauged by Google search trends – yes, hardly scientific] suggests at least one of the trends being graphed is certainly “going south”. 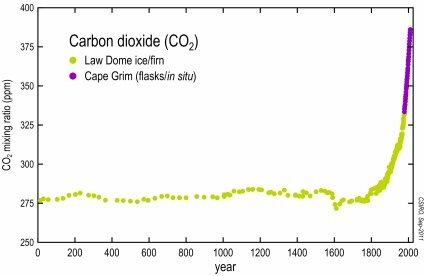 Carbon dioxide concentrations in the air were reasonably stable (typically quoted as 278 ppm) before industrialisation (in the timeframe of human existence). Previous PostIs the World more Peaceful?